Michèle Auclair (1924-2005) had a very strange career on disc. She was a pupil of Boris Kamensky, Jules Boucherit and Thibaud, an important prize-winner and an exceptional chamber player. 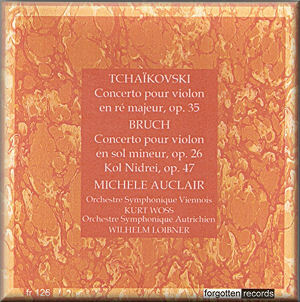 She taught, too, extensively in America where she also performed — there is an extant example of her Tchaikovsky Concerto from Boston, live, with Charles Munch. And yet, for all that, she was one of those artists whose studio career was rather limited. There was a lot of competition but it does at least account for the astronomically high prices her early LPs attract on the second-hand market. Her Schubert Sonata discs have attracted some serious cachet over the years, as have the Bach Sonata recordings with Marie-Claire Alain. But whilst she left many pieces unrecorded she was twice asked to record the Tchaikovsky, with which work she was clearly identified in the late 1940s and early 1950s. Forgotten Records disinters the one conducted by Kurt Wöss; the other one was directed by Robert Wagner in Innsbruck. Incidentally Forgotten Records notes the orchestra as the Vienna Symphony, but every reference I’ve seen points to the Austrian Symphony Orchestra. The recording puts the soloist right out in front, which is good for aficionados of such things but less good for orchestral balancing. Auclair is a bold, slashing Tchaikovskian, something of a speed merchant apt to over-egg her tone, but always interesting. Phrasally the opening is over-manicured, but whilst there’s very little light and shade in this performance, and much forceful lyricism, one can see why she should have aroused such curiosity in this concerto in particular. Steely and raw she may be, but this is never neutral playing; it’s terse, sometimes brittle, and full of razory panache and engagement. Very much not a David Oistrakh performance! Wilhelm Loibner accompanies her in the ‘Bruch in G minor’. The same conductor had taken the honours for the ageing Albert Spalding for Remington at around the same time in the American’s Vienna recordings. Auclair’s opening statement is let down by an intrusively fast vibrato but again the patterning of her phrases is well worth hearing as it’s often so unusual. The slow movement is rather unsettled, with her unremitting intensity and taut vibrato getting too much: it’s rather wearying. But the finale makes amends with some spirited and assured playing. One doesn’t often hear the Kol Nidrei recorded by a violinist, as it is here, and very nicely indeed. This is a faithful and well engineered transfer. Auclair is something of a forgotten figure, though she died as recently as 2004. Her playing is energetic, abrasive and charged with intensity. Even when one doesn’t much like the playing, she always leaves you with lots of things to think about. Too often today, violinists leave you with nothing to think about.